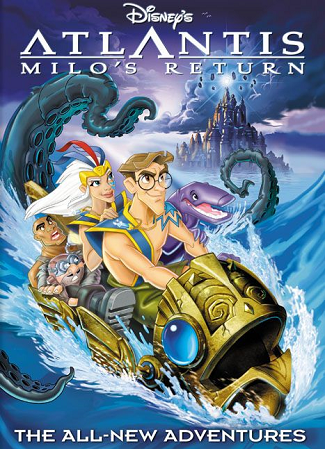 Atlantis: Milo's Return is a 2003 sequel to Disney's Atlantis: The Lost Empire. The movie consists of three shorts from a cancelled Recycled: The Series cartoon called Team Atlantis. After the original film, Kida and Milo are living as the Queen and King of Atlantis. Together, the two are attempting to restore the kingdom to its former glory. Milo's old comrades return unexpectedly with news of strange happenings on the surface. The gang first go to Norway where, instead of an Atlantic defense mechanism gone rogue like expected, they find a krakken. It turns out the town leader has made a deal with the krakken. After defeating the krakken, the characters then go to Arizona. They find old Atlantic architecture there. Unfortunately, they come across a greedy man named Ashtin Carnaby who wants to make a profit off of the architecture. After dealing with Carnaby, the final mystery involves an old competitor of Whitmore's named Erik Hellstrom. Under the belief that he is Odin, Erik stole the Spear of Destiny (an Atlantean artifact) from Whitmore. After they track him to the Nordic Mountains, Erik kidnaps Kida because he believes her to be his "long lost daughter". The characters discover Erik's plan to end the world in Ragnarok. He creatws a lava and an ice monster, but explosives used by Vinnie cause the beasts to turn on one another. After these events Kida realizes just how powerful the Atlantean Crystal is. She recognizes that it was wrong of her to hide the Crystal from the rest of the planet. Kida combines the Spear with the Heart Crystal and lifts Atlantis up to the surface, reuniting Atlantis with the above world for the first time in over 9000 years. Compilation Movie: The film is three shorts in one. Milo delivers the phrase "two for flinching" when he gives Audrey a second hug after the first. Mole whispers something to three Atlantean women which causes them to beat him up for the remainder of the scene. You'd think he'd have learned his lesson the first time. Cookie serves the slop from the first expedition again with the line "I told you it'd keep and keep and keep, now it's yours to eat and eat and eat". It gets fed to Oggy the moment Cookie isn't looking. When describing the size of the locks Kida should use to secure an allpowerful Atlantean spear, Vinny says "Locks, big ones" and uses the same gesture as when he described large paper clips. The End of the World as We Know It: Erik Hellstrom, under the belief that he is Odin's reincarnation, steals Gungnir from Whitmore's mansion and attempts to use it to bring about Ragnarok. To be honest, Hellstrom's view of Ragnarok is a bit warped, since it mainly involves Surtr setting the sky ablaze and Þrymr freezing the surface of the earth as they both hold Gungnir. Genre Shift: The film has a Paranormal Investigation theme (and Atlantis itself only appearing at the beginning and the end, though its legacy is apparent throughout the film). Harmless Freezing: In part three, our heroes are all frozen by Ymir's frost breath. They're later thawed out by Hellstrom, all of them totally fine and ready for a chat. Off-Model: The animation is a bit choppy and is lower quality than a few other Disneytoon Studios works because it was intended to be a televised cartoon series, not a film. Sanity Slippage: Erik Hellstrom lost his grip on reality after the stock market crash. He now believes that he's Odin. Spell My Name with an "S": The mythical Norse spear Gungnir is refered to as "Gunokneer", presumably as a result of being described by Atlanteans. You Don't Look Like You: Kida's face is structured differently than in the original film. It can't be choked down to age either as everyone else is the same and barely any time has passed between films.